Comic Nom: Man of steel thoughts. Super hero movies have come a long way since Richard Donnar’s 1978 Superman masterpiece. In fact they have come a long way since the first X-Men movie. The first wave of Marvel's little project raised our expectations for the genre. The Nolan Batman Trilogy showed us a level of grit that we had not seen in comic book conversions since the badly received Punisher title. I say all this because last night I travelled to my local cinema to experience the Man of Steel. It began with an all Krypton opening that could have (should have) been a movie in its self and then just as you begin to fall deeply into this wild and strange setting you are jolted out of it and you see earth in all her glory for the first time. From that point on you are given a well paced and thorough origin story told through layered and none linear flash backs. The story is about fledgling Superman coming to terms with the responsibility that his god-like powers bestow upon him, while the flashbacks show a confused child trying to get understand his place in the world and constantly battling to hide his power from the world. The story soon escalates to a full blown conflict with the infamous General Zod and his troops. The cinematography is astounding during all the action from start to finish and the acting is well above average. The thing that worked the most in the movie for me was the perfect casting throughout. Amy Adams as Lois Lane was wonderful to watch and she really was as close as she could have been to the character that I have been reading about since I was a child. The new suit was also a surprising positive to the visual experience. They have managed to take a classical design and with very little modification make it look contemporary and at the same time quite alien. Then there were the things that didn’t work for me, and there are a few. Firstly upon entering an ancient Kryptionian ship crashed on earth (under lots of ice) Mr Kent uses a control key from the pod that brought him to earth. I understand that his father was a genius and I really do buy that he put an AI construct of himself into the key that can take over Kryptonian technology but what threw me was the way that a few minutes after first talking to Clark he opens a door to show him a perfectly tailored uniform bearing the El family crest. I have to assume that the AI construct had it manufactured by machines on the ship but it’s just not explained at all. Then there is the technology. As I read the source material (comics) I always envisioned Kryptinian technology to be like our own earth technology but with more visible crystalline elements, in the movie however we see an almost organic technology with strange metallic constructs instead of computer screen or projections. It’s a strange look that I feel would have been more at home in the 'Aliens' franchise than a Superman movie. For me it was drastically out of place. The Third act of the movie was where it changed. Up until this point I had some minor gripes but the movie had me and I felt like it was genuine story telling rather than a ‘wow factor’ driven money maker. The movie had built to outright conflict well but when the action was delivered (spoilers ahead) and Mr Super Kent had to fight General Zod, man-on-man. There was no Kryptonite written into the script. He had to beat Zod to death and it was obvious that this was the direction it was going. 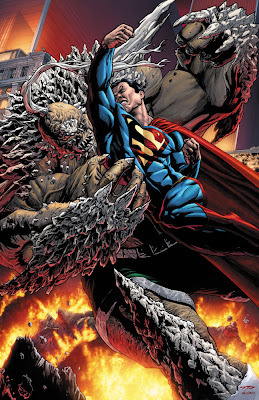 Sooner or later Superman would have to kill his enemy and do so very close and personal. It played out as predicted but the emotional impact for the character was lost because of the crazy over the top building throwing mess of a fight that I had just watched. It was great to see Zod ‘learning’ to use his powers as the two fought but with all the destruction on the screen I almost lost track of the actual protagonists. I understand that when two super-beings fight the scale has to be very large as there is little that can get in their way as they fight but from the point of view of a movie goer it was a mess. I would rather have seen a more subtle enemy than Zod in this movie. If it had been me writing it I would have focused on Clark Kent as a person and maybe pitted the Man of Steel against someone who he couldn’t just punch to death. I wonder though, now we have seen a fight like this how will we ever see it topped in regards to enemies like Doomsday. He seems like an ideal enemy for cinema but now we have become so desensitised to massive destruction on screen I doubt it will have the same impact. My final thought on the movie is that in all of the superman movies I have ever seen (that would be all of them) there has been a sense that Krypton exploded a long time ago and little Kell-el’s pod took years in cryo-sleep (or other sci-fi magic) to reach earth. In this movie it was a recent event, maybe a perspective correction form earlier movies but definitely something that I noticed. When it comes to verdict its easy, this was a good movie but not the masterpiece that I expected. Go see it. Its pretty cool.